Some people grow up surrounded by fresh herbs. They watch, or help, as their parents grow herbs, chop herbs and garnish dishes with soft handfuls of basil, oregano, parsley or sage. Other people discover the magic of fresh herbs later in life, and meals are never the same afterward. Discovering fresh herbs marks a turning point for any cook. Suddenly, every dish has more taste than ever seemed possible! Still others become adept at both cooking with herbs and growing them on their own. For many years, Linda Johnson, garden center manager at Wolff’s Apple House, has inhabited this third category. Hearing her talk about herbs is like taking quick jaunts from garden to kitchen and back again. Even before she began working at Wolff’s, Johnson came to the Wolff’s garden center to pick out her herbs. “I’ve never seen a selection like our herb selection,” she says, mentioning the thirteen varieties of basil Wolff’s carries right now… from Thai basil (noted for its hints of licorice) to Greek basil (a strong basil with cinnamon flavors), and Minette (a mild variety that grows in petite and pretty clusters). “You could have a field day going through here and thinking about your herb garden,” says Johnson. And from the sound of it, Johnson does. Through the years, her garden has brimmed with basil, oregano, parsley–both curly and flat–rosemary, sage, thyme, stevia, chamomile, cilantro, mint and, for the sake of her own cats and those of neighbors and friends, catnip. 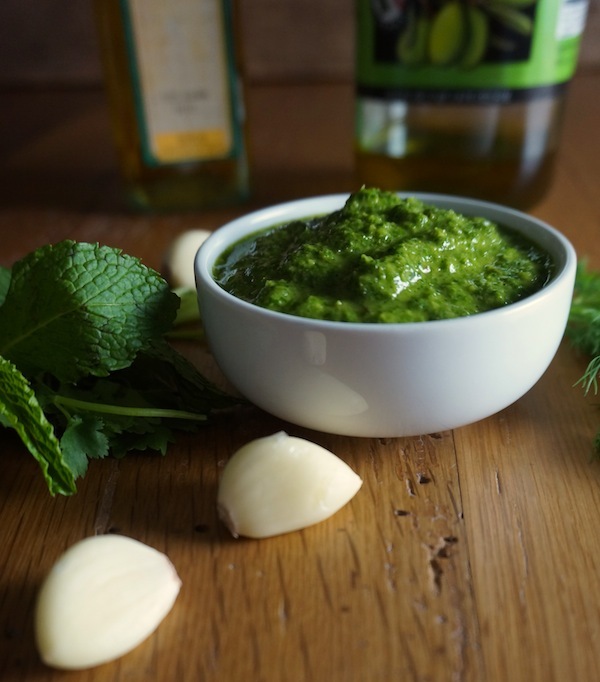 This recipe will make a LOT of tangy, amazing chimichurri. Chop all of the herbs and garlic until they are very fine. You can use a food processor for this, pulsing until the herbs are finely chopped. Stir in the vinegar and olive oil until they are combined with the herbs. Don't use the food processor for this step, as the process is too harsh for the olive oil and you may end up with sour olive oil. You can freeze any extra chimichurri. All types of rosemary leaves can double as aromatherapy, says Johnson. If your energy starts to lag, rub a little rosemary on your hands and you’ll have a natural pick-me-up. Eating this herb, she says, can also stimulate memory. Johnson also plants a lot of mint. She advises gardeners to plant it in a pot, because once you’ve added a few mint plants into your yard, they are there to stay. Johnson, however, is quick to admit that she does not follow her own advice. “I have a plot,” she says. Not surprisingly, the productive plant finds its way into Johnson’s kitchen again and again. “I make a pot of mint tea every day in the summer,” she says. To sweeten her iced mint tea, she adds two or three stevia leaves, which also come from her garden. This year, Johnson wants to try a new herb in the garden: horehound. This leafy herb has been used medicinally for centuries, dating back as far as the Roman Empire. Johnson wants to make cough drops from this herb, and there are many recipes for horehound lozenges that would be easy to make at home using local honey. She also notes that cilantro is well regarded for its anti-inflammatory properties, as is gotu kola, a productive herb that grows wild in roadside ditches in India. With such a flourishing herb garden, Johnson grows so many herbs that she has leftovers. These she dries. If your herb garden is super productive as well, try these tips for drying and preserving the extras! Pick a perennial. After most winters, your herbs will come back. Read about the size of your selected herb very carefully. Some herbs can turn into a huge spread. Make sure your herbs will have enough space to flourish in their plot. 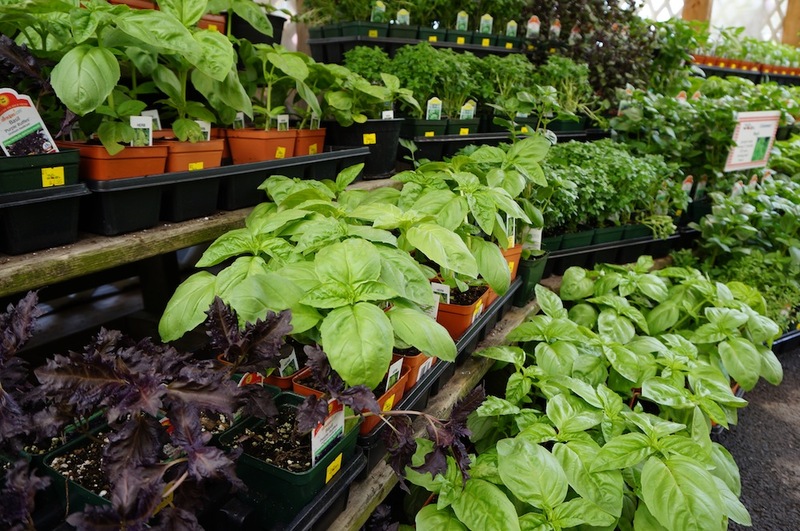 Herbs tend to like well-drained soil, full sun, enough space and good air circulation. One thing Johnson also makes sure she does is enjoy the seasonal nature of gardening. She gardens during gardening season, but she doesn’t keep herbs in containers year-round. “Winter is welcome,” she says. For her, it’s a time to rest on the couch by the fireplace. With dried herbs in the pantry, horehound lozenges in the medicine cabinet and a fire blazing in the hearth, Linda Johnson enjoys each season in the life of the gardener. Right now, she seems pretty excited about planting season. “Our herbs are rocking,” she says. Come and enjoy herb planting season! The rocking selection at Wolff’s won’t last all summer, as there will soon be many great summer plants to take their place!